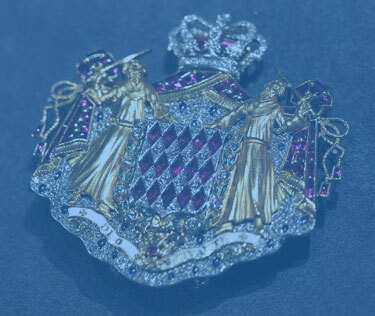 A brooch depicting the Grimaldi arms, which being the arms of a Prince are displayed beneath a mitre crown on a mantle of ermine, Fusily (or lozengy) argent and gules. The supporters (two monks wielding swords) refer to the conquest of Monaco in 1297, when François Grimaldi entered the city with soldiers dressed as monks, with swords hidden under their cassocks. The collar surrounding the shield is the Order of St. Charles, a Monaguesque order founded in 1858. The Grimaldi motto is Deo Juvante “With God’s help”.